11 Harkyn and Guard Captain have met before. They have good reasons to dislike each other. The main path from here leads by the Citadel walls, left from the statue with a brave Knight facing a Snake (symbol of death). After reaching the Shard close to the back entrance to the Citadel (closed now), head on through the gate and the path leading down towards the third, Burned Watchtower. Heading on past the Watchtower and further down to the Cemetery Gates leads to finally meeting Kaslo 12 . Defeating the Worshiper at the Cemetery 13 will open your path to the the Abandoned Temple, a place where you will cross into the demon realm. Return to Kaslo after having killed the boss. There is a checkpoint to your left. Afterwards, defeat the enemies in the courtyard. and head up each flight of stairs. Two harder enemies await you here and they each guard a lever that will open the gate below. A barrel near the left-side lever hides a small sealed rune. After opening the gate, you will meet Injured Monk, this NPC has been bitten by a spider and will die if you don't cut of his hand. You can chose to assit him and severe the limb, or not. Cutting his hand will reward you with experience and trigger the option to give the monk a health potion for a further 500xp. Doing this ensures you meet him later!. On towards the archer that you left alive at the Main Wall, a small lever on the wall directly behind the Gauntlet opens a shortcut to the North Watchtower. After you have unlocked it, head towards the archer on the South Watchtower and up a set of stairs, towards a checkpoint. As you approach, a cutscene with Yetka will play. You may chose to let her kill or save the monk. After your conversation with her, go back to kill the archer and then down the stairs to find an enemy and the audilog Fancy Looks. Also in this room there is a chest with Lethal Secrets and a Fire Resistance Shard. Note the anvil next to the chest: this will be a blacksmith spot later on, once you have encountered the Crafter. The room behind this holds the Live Elements Chest Armor and a Magic Energy Shard on a chest. On the side of this room, you can drop down to obtain the Tower Key. Down the ramparts, there is a locked door behind which the audiolog Sixth Night is placed. Further ahead, behind an axe Rhogar, a chest holds the axe Fate. You may jump across the small gap and turn left to kill an enemy, jump a gap, and get to a chest with the Prejudice staff and a Small Sealed Rune. Then backtrack to access to the North Watchtower's lower levels. After defeating several enemies in the room, pick up Yetka's Dagger and open a nearby chest for the Hot Blood Wrist and Legs and the Pain Hammer. The stairs up return you to the locked door you had encountered earlier. Before this area, in the Southern Watchtower there is a room with a Demon Spider. The room has a chest with a Spike and a Magic Energy Shard. If you are too weak to fight the spider, run past it and up the stairs, then you can head back to Yetka to return her dagger and obtain 800xp and the Catacombs Key from her. You may now enter the Square of Heroes and defeat the Commander boss. Then make your way through the stairs up to the Memorial. Here, the Guard Captain will refuse you entry into the Citadel. and send you to find Kaslo at the Graveyard. Progress beyond the Guard encounter and take a left outside the building to go through the dimension portal. After completing it, the Bloody Flint is visible in a path ahead marked as 10 on the map and further ahead a dead end with the audionote Fourth Night. Head back towards the portal and find the other way to go, then pick up the audionote Last Night.near a statue. Killing some more enemies will return the objective "Find Kaslo" and place you near the checkpoint of the area marked as number 31 on the map. Look right to the checkpoint and there's audionote Guard Notes - but be mindful of the enemy ambush!. The door next to this is locked, and requires the Southern Trench Key. If you go left there is the Backside Entrance to the Citadel. There are some tough enemies guarding a sealed rune chest. It contains Guardman and an Empty Bottle. There is also a breakable wall to the left of the entrance to the Citadel that contains Blind (you may not be high enough level to kill these enemies at this stage).Continuing forward will take you to the Outer Walls and face you against heavy shield enemies. It is recommended you run-jump to attack them. After two of them, you will find an infested enemy and to his left the entrance to the Burned Tower. At the top of this tower, marked as number 12, is the Beacon, which you can now light for 1000xp. 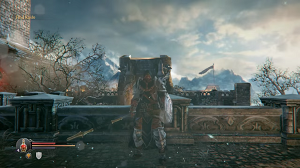 At the bottom of the burned tower, hides a chest with an Empty Bottle, Heavy Shield and Buckler. Use a nearby lever to unlock a shortcut. After unlocking the shortcut, going back to the base of the stairs leading into the circular room from outside, there is a dropdown to another chest containing an Empty Bottle, a skill point shard, and the Guard's Greatsword weapon ( confirm name). The path from the chest holds the audionote Grim Graves, and further down, a drop off leading into the graveyard and the Worshipper fight described below. 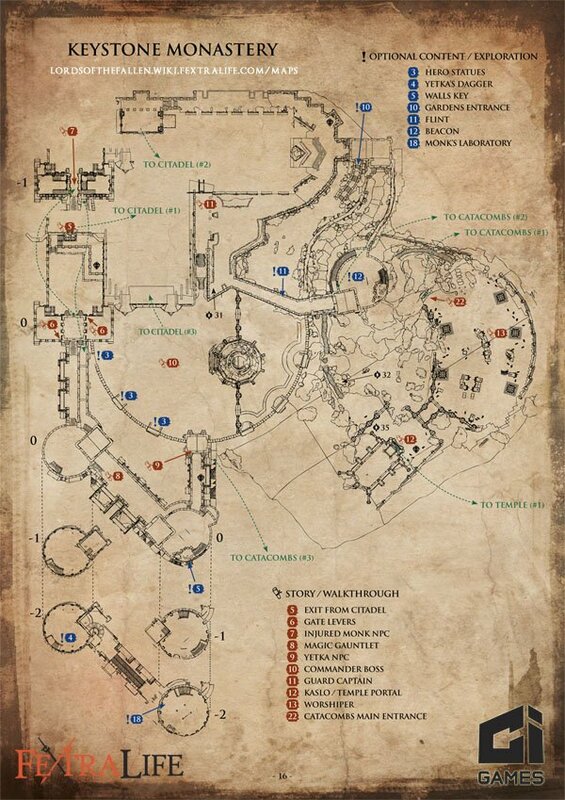 Continue down (or returning after the fight if chasing secrets) towards the Graveyard and note number 32 on the map, the dimension portal (now closed). Next to it, a chest contains Ghost Merge Shard, Steel Dagger and Steel Sword. There's a checkpoint near you and you can find a Human Skull item hidden next to it. Talk to Kaslo and then face the Worshiper boss. After killing Beast and doing all of the things there are to in the Citadel you will leave through the door at the bottom of the stairs at the end of the main hall (there is statue near it and a couple of NPCs). Exiting the door, there are two large shield enemies here and a breakable wall on the right (if you didn't earlier on). Continue on and kill the enemies. There will be a sealed rune chest on your right containing Guardman and an Empty Bottle (if you didn't open it earlier on). Head straight past the checkpoint and down towards the Graveyard. The Dimension Portal right outside of it ill now open because Beast is dead. Inside is an Infinite Void that requires you to follow the light around a very dark area. You will die if you don't stay near it. You will be attacked by two Rhogar at one point and then the light will disappear over a chest containing a Poison Resistance Shard. Once done there head into the graveyard, kill the enemies and head into the Catacombs. the chest only contains head and chest. where are the other 2 parts? you open a rune chest and get 2 parts of light armor, and you open normal chest and get set of heavy. what kind of bs is this?